There's something about North Park that just feels "right" for craft beer. Maybe it is the fourteen breweries and tasting rooms in a 2.5-mile stretch. Maybe it is the hip crowd that lives and parties there. Maybe it is the active street life and the mixed-use neighborhood vibe. Maybe it is just because North Park was where I began to dive deep into San Diego craft beer. Whatever the reason, the event held on November 10, 2018, in the parking lot of the North Park Observatory music venue was a smash hit. No wonder it won West Coaster's readers' poll for Best Beer Event in 2017. I'll be surprised if it doesn't win again this year. Just after VIP entry started. VIP entry was smooth as a stout on nitro. There wasn't a huge crowd when I arrived about fifteen minutes after the opening, so it hardly took any time to scan tickets and pick up the commemorative taster glass. There was a bit of a wait to get the t-shirt, but it is a great shirt so it was totally worth it. And Mark Weslar from Karl Strauss was kind enough to meet me in the t-shirt line and bring me a beer. That's how to make an impression! The weather certainly didn't hurt the occasion. It was sunny and warm without being too hot. The crowd was relaxed and happy. The crowd filled in soon after general admission opened but it never got ridiculously busy and it was rare to have to wait more than a minute for a pour. That lack of line pressure also made it much easier to talk to brewers. I hung out with San Diego Reader's Ian Anderson and Ian's friend Jordan, chatted with Brian Beagle and Estella Davilla from the Indie Beer Show podcast (now available nationally! ), met an Instagram star and her photographer husband (@coco_sandiego), and at various points saw lots of other people I sort-of know from the online beer world (including Beth Demmon, writer of San Diego City Beat's Final Draught and Kristine from IG's @womensbeercollective). The beer was, of course, excellent. Karl Strauss organized nearly sixty local breweries to make collaboration beers with each other. I'll just mention two of the many I sampled: Karl Strauss remade the porter that won the first GABF medal for San Diego (I hope I have that story right, someone let me know if it is off), and Pan a Flores by SouthNorte, a strong porter inspired by café de ollas (with cajeta, chocolate, coffee and cinnamon). Many others deserve mention but I was chatting and making photographs instead of taking notes, so you'll just have to believe me that there were lots of interesting beers! 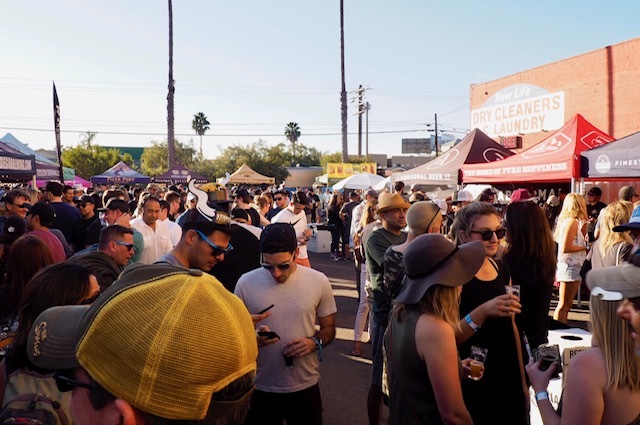 If you have to pick just one San Diego Beer Week event next year, this might be the one to choose. With thanks to Mark Wesler and Karl Strauss Brewing for the media pass for this event.